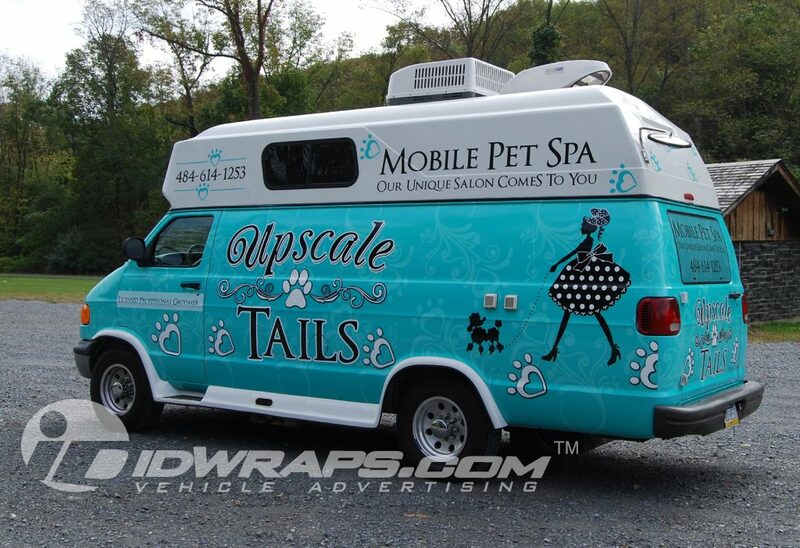 Upscale Tails is a new start up licensed and insured mobile dog grooming business in the upper Pottsgrove -Pottstown area. Never have to worry about being caged in a heated dryer. Instead they are absolutely pampered to the highest degree while listening to soothing spa music delivered on a Bose sound system. Owned and operated by Angela (Angel )Davidson, a graduate of the dog grooming school of Pennsylvania. Upscale tales absolutely delivers on every facet of the dog grooming experience. During her quest in becoming a state license groomer, Angel received excellent marks and graduated at the top of her class. Her commitment to continued education is evident as she recently acquired her canine CPR certification .” There are many more classes to come ” said Angel. Understanding that our little furry companions are very much like ourselves and different in so many ways, Angel, is also very dedicated to research. This ensures that your pets are receiving the highest quality of care and products available specifically tailored to their needs. Call today, your pet deserves the best!! All the time we’re out and about and see so many plain white box trucks driving around. What a shame. At IDWraps.com, we see these examples as missed opportunities to make a mark. Pictured below is a prime example of a seized advertising opportunity. This Isuzu van wrap has very clear branding which was carefully crafted by the IDWraps.com design team. It also has proper text hierarchy which helps guide the prospect through the critical information while making that first impression. On this design, it is clear that branding is to be the focal point. We often ask our clients to define text priority on their designs. “What is most important to be read first?” From here, we may assign size and weight to text and other design elements. The three key items that usually reside on a wrap design, or many other forms of outdoor advertising, is Who we are, What we offer, and How do you reach us. In many small businesses, the What we offer is often the most important item on the design. 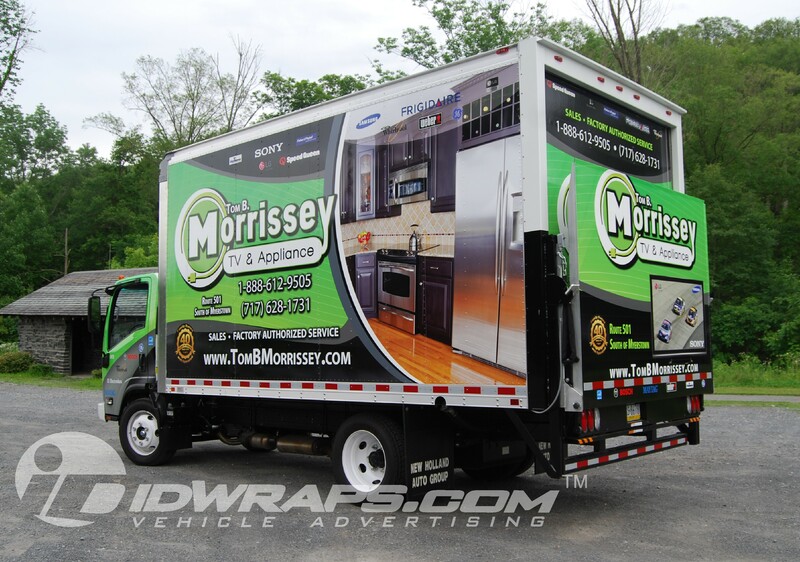 Folks like Tom Morrissey are able to leverage branding very effectively through their fleet of vehicles and multi-channel advertising efforts. Many smaller businesses are often better served by focusing on the offer. In this sense, when folks have 2-3 seconds to read your wrap when passing by- they get right to the “what can you do for me.” This customer centric approach is often highly effective for businesses with lower advertising budgets. A full scale branding effort usually involves multiple forms of advertising to effectively reinforce the message to be memorable. This is often beyond the budget constraints of a typical small to medium sized business. Shown here with the lift gate down, exposing an identical graphic layout from underneath. It surely is a daily occurrence that we get calls to wrap cargo vans, trucks, and all other sorts of usual prospective wrap projects. 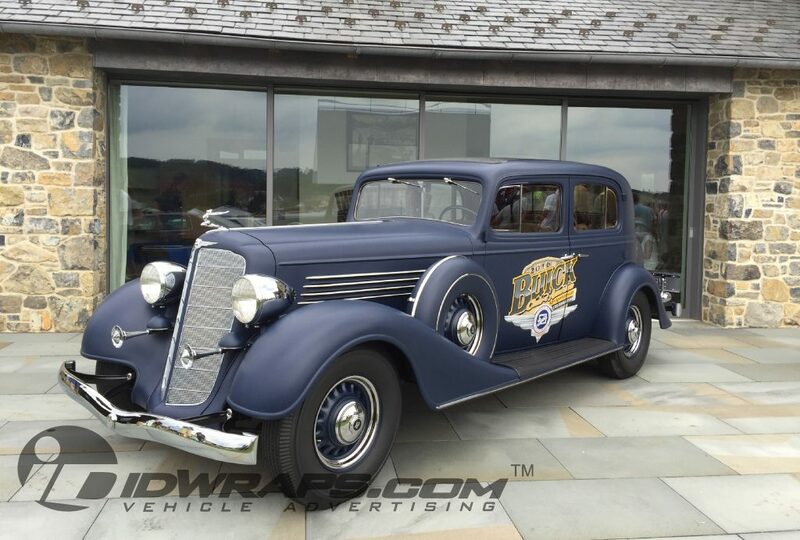 Then there was the day that we were enlisted for a classic car wrap on a fully restored 1932 Buick for the Bulgari collection which was to be one of the centerpieces for the Buick Nationals 50th Anniversary car show event. The start of the project began with a personal tour of the 27 acre Bulgari Allentown Classic Motor Car facilities and park which house an extensive collection of American classic vehicles. What an amazing sight, as we were enlightened on the many stories behind the 100+ car collection of vehicles from the early 1900’s. Every specimen represented in fully restored fashion and elegantly presented upon the glossiest epoxy floors we have ever seen. For those not familiar with the Bulgari name, the facility is owned by Nicola Bulgari, whom is the great grandson of the founder of the Bulgari jewelry empire. So why would a billionaire not have a garage full of supercars, you may ask? Nicola grew up in Italy during the 30’s and 40’s and always had a fascination with American vehicles and culture. In many ways, Nicola and his restoration team essentially “save” countless auto treasures from deteriorating to a rusty end. Some notable vehicles in the collection include the taxi from the movie “It’s a Wonderful Life,” a 1940 Buick Estate Wagon owned by Bette Davis featured in the film “Now, Voyager,” the Buick pictured on the cover of Peter Paul, and Mary’s greatest hits album. Mr. Bulgari has a specific affinity for classic Buicks. At the end of our tour, the IDWraps team was shown a 1932 Buick which was in the process of being restored. This vehicle was selected to be the promotional centerpiece of the upcoming 2016 Buick Nationals event to be held at the Bulgari Park in Allentown, PA. What started out as a full print classic car wrap project, eventually turned into a mix of digital films and color change films by 3M. As much as out team wanted to apply modern techniques and design to this car; it was eventually decided to stay faithful to the era of the vehicle’s model year. CLICK HERE to view an Ariel video of the Buick circling the beautiful NB Center located in Allentown PA. Yes, this was a very curvy car. We’ve had our share of VW Beetles, and many other extreme compound curved vehicle body types, but this classic car wrap was different. The base color selected for this project was 3M’s 1080 matte Indigo which was undoubtedly tested to its mechanical limits. 3M publishes a 150 percent stretch limit on this film, and we needed every inch of conformability for this project. One glance at the front fenders would make any installer scratch their head a bit. The other challenge was the finish quality expectations. This wrap was to be installed with an absolute white glove show quality level. Unlike many daily driver color change projects, this one had very little tolerance for seams and no tolerance for exposed OEM paint. Couple this elevated standard along with 80+ year old paint; we were in for a challenge. The printed portion of the classic 3M Vinyl car wrap installation included the Buick National event and various sponsorship logos which were printed on 3M IJ180Cv3 using our HP L360 latex printer. The prints were then laminated on our Seal Base 62 laminators with 3M’s 8519 luster laminate. This finish gave the printed graphics just the right amount of “pop” while retaining the classic design for the museum quality restored vehicle. The vehicle was delivered and showed to rave reviews, receiving a great deal of press coverage at the event which was attended by over 2000 exclusive Buick Club member collectors from around the world, along with General Motors executives. Thousands more got to see the Allentown Classic Motor Car facilities and show when the gates to the event on the final day. National installation and services near you! 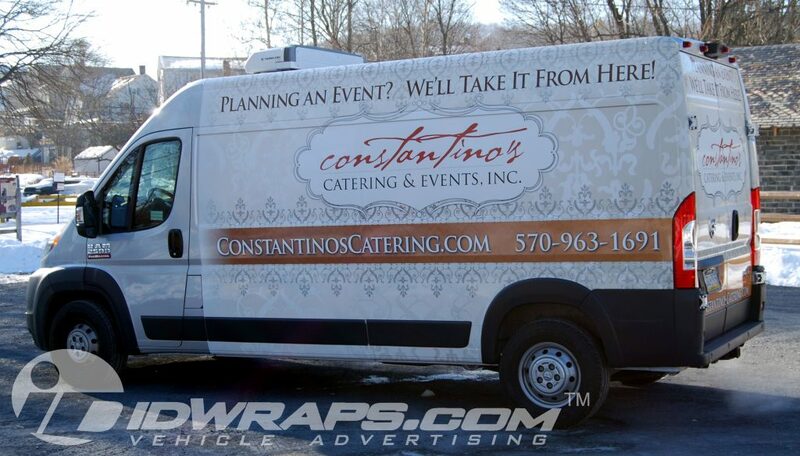 Here is a catering van wrap we completed for the folks at Constantino’s catering. Check them out at constantinoscatering.com. This forward thinking caterer select the IDWraps 3M certified team for their fleet wraps. For years, this company drove to events with ordinary vehicle lettering on their vehicles. It surely is difficult to stand out when you blend into the crowd. Their new look exudes the elegance that their company delivers. Does your fleet look its best when showing up at events? Many service businesses view the image of their fleet as essentially the “curb appeal” of their business. What is it that will compel prospects to call? Maybe it is time for a business perception face lift with an expert wrap design. Today’s graphic designers may mix a formulation of 16 million colors, photographic elements, and razor sharp text to create a high impact flow on any vehicle. This design discipline is what truly makes our client’s phones ring every day with new business. The directive is essentially similar to high end outdoor billboards. Often, less is more when prospects only have 3 seconds to remember your catering van wrap advertising. So many wraps out there have unbelievably cluttered designs. This always makes the layout very hard to read. What good is the ad when no one is able to read it? Unfortunately, the vehicle wrap advertising industry is fraught with horrid designs which are doing a disservice to the vehicle owners. Have a look at our IDWraps gallery for some cleanly designed examples which are highly effective: Click Here . Once our clients become educated on well executed design, they soon are able to pick out the winners from the less effective wraps when they’re out on the road. 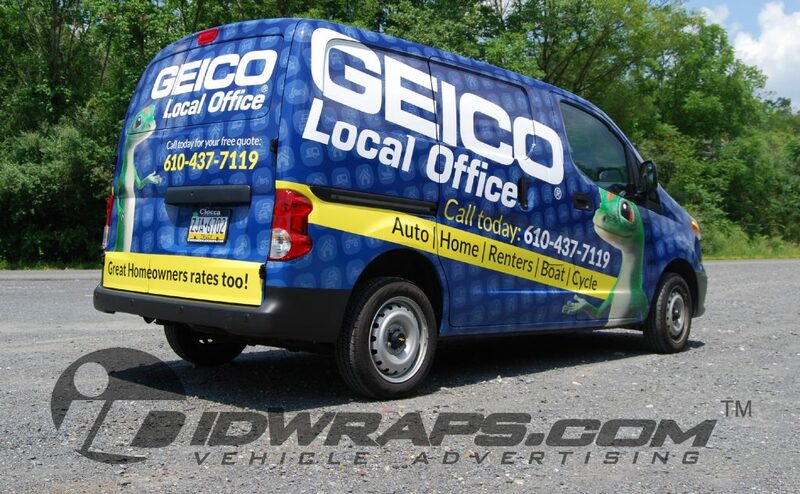 Here is an unavoidable Nissan NV200 Wrap that out 3M MCS certified team produced for the folks at Geico car insurance. This specific van was for their Lehigh Valley office located on MacArthur Rd. Compact cargo vans like the Nissan NV200 have become very popular among businesses of all sizes. Historically, we were wrapping mostly the larger full size cargo and passenger vans. There certainly has been a swing in popularity towards the smaller vans. A few reasons we’be been hearing is 1) Fuel economy. We’ve heard of fuel cost savings amounting to over $1k per year in some instances. 2) Smaller size. The compact footprint on these vehicles allow for easier maneuverability, especially in metropolitan service or delivery areas. It sure is easier to park a small vehicle on Market Street in Philadelphia, or Canal Street in New York. Streets like this have little to no parking. The parking that is available is usually crowded and tight. Nissan’s entry into the commercial van market has certainly ramped up the US based competition. No longer are there only 3 go to manufacturers of commercial vans. We’ve been noticing many incentives offered at the dealership level. These upfit programs include free bins, bulkheads, and also incentive dollars towards vehicle wrap graphics. If your dealer has such incentives, be sure to reach out to IDWraps.com for more information on our Nissan dealer program. Perhaps your van wrap may come to you at no cost, or could be built into the financing deal. Many IDWraps may be installed right at the dealer (anywhere in the USA) prior to delivery, which provides for a convenient turn key service. 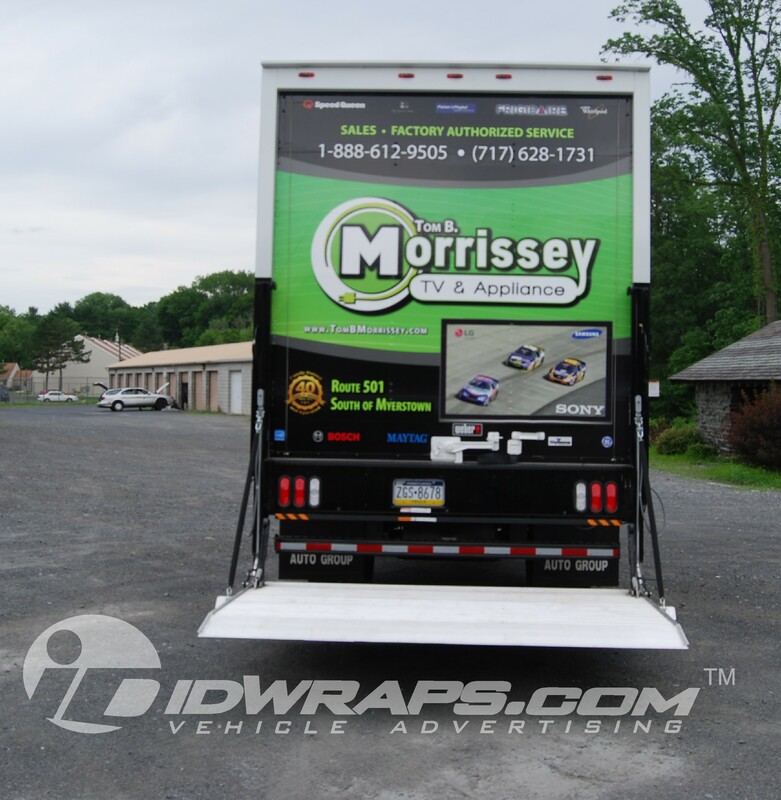 IDWraps.com also has programs for all other major commercial vehicle manufacturers. 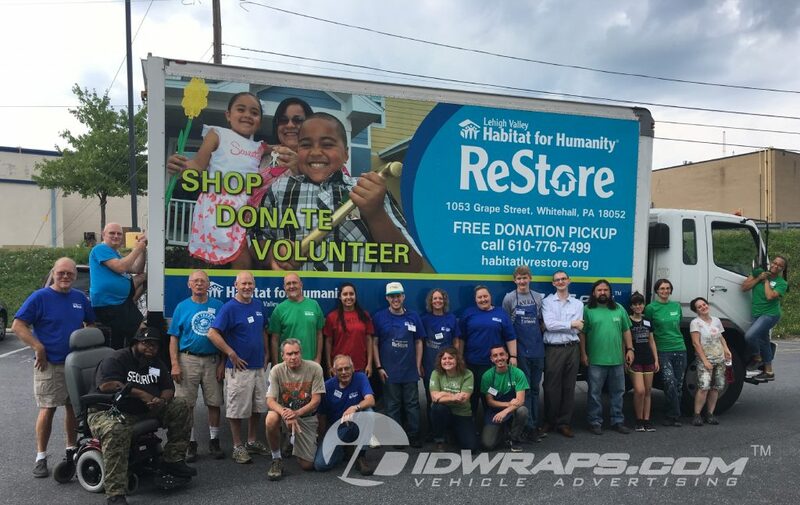 Some of the founding partners of ReStore are: First Niagara, PNC Bank, PennCap Properties, and First Presbyterian Church of Bethlehem, PA. A few of the sustaining donors are: Lowes Home Improvement, Tractor Supply Company, True Value Hardware Stores, and DM. If your business is cleaning out a warehouse, or has extra inventory to donate, please do consider donating today and help local families in need of a safe, decent home. Here is a Cadillac ATS wrap our 3M Certified team completed for the folks at Visiting Angels. This luxury car received a full wrap which not only offers excellent outdoor advertising, but also paint protection. Every square inch of this American premium ride was covered in 3M’s best removable vinyl film. The removable aspect of this material really helps when it comes time for a resale of the vehicle. That’s right, this wrap offers a level of paint protection. This feature is not only being utilized in today’s commercial advertising wraps, but also in restyle or color change wraps. If clients are after a very unique color, say like lime green or bright pink- they may use a vinyl wrap instead of paint. When it comes time to sell the vehicle, the wrap may be cleanly removed without damaging the paint (this is assuming none of the car has been previously repainted.) Aftermarket paint jobs are at risk of peeling away when a wrap is removed. Being that this van is supplied by Toyota and is replaced every two years; removability is key. The premium 3M films we used on this project not only delivery a high quality finish and durability, but they are also the friendliest to remove. 3M has proven that many competing products may take in excess of 3x the labor to remove wrap films. When installed on OEM paint finishes, 3M wraps come off clean every time- glue and all. In the event that your vehicle has been in an accident and repainted, some caution is to be exercised. Aftermarket paints rarely bond to the vehicle as well as the factory paints. This may cause an issue when a wrap is removed. We’ve seen paint come off vehicles more than once when removing a vehicle wrap. Wrap adhesive systems are designed to be applied and removed to factory paint. If you have an older repainted vehicle and wish to “drive it until it dies,” then removability and potential paint damage may be a non-issue. 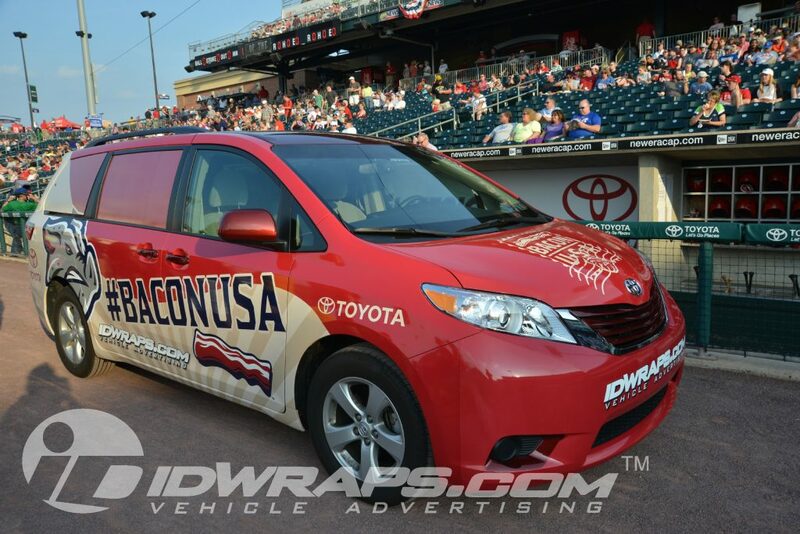 Here is the van pictured in the stadium where it takes a parade wrap at the beginning of every game. 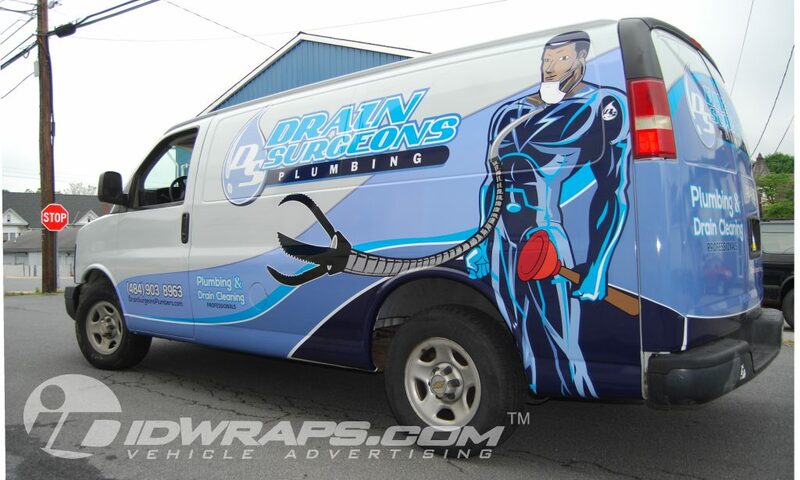 Here is a plumber graphics wrap that out 3M certified team completed for the folks at Drain Surgeons. This was a ground up brand development for this client, which included logo and Icon creation. The illustration was drawn from scratch and resembles the client’s stature. The logo creation process can often be a lengthy process. At IDWraps, we shorten up this cycle and make this process much less painful and time consuming. Our proprietary creative brief is designed to get us to the core of a value proposition, meaning “what exactly resonates with your customers and prospects.” In short, what is your secret sauce? Why should a prospect choose you over your competition? If you’re not able to answer this question, you may have a tough time being competitive in the marketplace. Getting to the root of your value proposition sometimes comes best when polling your clients. After all, who better to get this feedback from than the very folks that prefer your services. Why is it they do business with you? What are your competitive strengths? If you were to rely exclusively on your staff for this type of feedback, you are certain to get a perspective that may be quite disconnected to the reality of the market. As business owners, we are always experts at selling to ourselves. This is why many large corporations and companies rely on focus groups for every little marketing effort placed forward. Small to medium sized businesses need not to go to this sometimes pricey effort. A simple email blast to a key client list may do wonders to sharpening a campaign message. Many clients may appreciate being sourced as an expert opinion. You could also take a few of these folks out to lunch for a little back and forth. We’ve encouraged many of our clients to seek these types of opinions for their plumber graphics wrap projects. So, what is your unique value proposition? 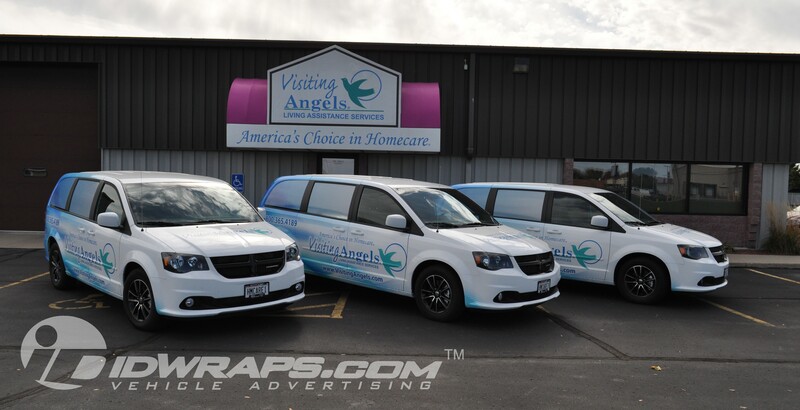 Here is a set of 3 minivan fleet wraps we completed for the folks at Visiting Angels of Central Wisconsin. This national branding effort has been a very successful way to reach out to thousands of prospects daily. The average small town light has 10,000+ vehicles traveling through it. If you’re in a medium sized town, you could use your imagination as to the quantity of available eyes on a wrapped vehicle throughout each day. Yes that is thousands of daily impressions per vehicle. Visiting Angels franchisees also enjoy a significant image and trust boost from the professional looking minivan fleet wraps. Ask yourself: Would you be more comfortable with senior care service from a well dressed staffer stepping out of one of these vans, or a suspicious looking unmarked passenger or cargo vehicle? Image is everything in today’s market where we are blasted with thousands of marketing messages every day. Vehicle wraps are an excellent way to stand out in the sea of largely unmarked vehicles. Being a relatively new medium, fleet wraps do offer a greater retention rate when viewed by a prospect. If done correctly, these impressions will lead to phone calls. Far too many wrap designs currently on the street have poorly designed “over the top” designs. In ways, these atrocities almost seem too desperate for attention. What good is that attention when NO ONE CAN READ IT? No, not every business needs a monster truck show announcer for their business. Very often, less is more when it comes to any form of outdoor advertising.